Xīn nián kuài lè, and Happy Chinese New Year! China is believed to be the world’s largest Internet of Things (IoT) market, responsible for an astounding 22% of the global IoT market share. With support from the Chinese government, IoT initiatives have exploded in popularity throughout the last decade. Among these technologies, Semtech’s LoRa® devices and wireless radio frequency technology (LoRa Technology) has rapidly emerged as a leading choice for low power wide area network (LPWAN) connectivity in China, enabling successful solutions across numerous vertical markets. LoRa Technology is increasingly being leveraged in China to create efficiencies, from IoT enabled bike-share solutions, to smart metering for municipal utilities. 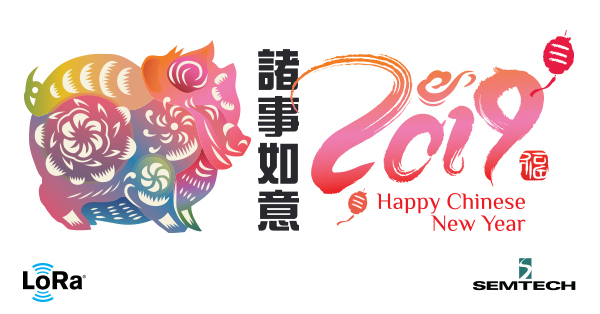 As the Year of the Pig approaches, we’ve featured some LoRa-based highlights from China to celebrate a successful Year of the Dog. In April, Alibaba Cloud and China Unicom jointly announced that they would be developing a large-scale LoRaWAN™-based network throughout China. Semtech, Alibaba Cloud and China Unicom will be collaborating to develop smart city solutions using the network. China’s LoRaWAN-based city area networks will be deployed by the Zhejiang Provincial Company of China Unicom in the cities of Hanghzou and Ningbo. Alibaba Cloud will support these efforts by establishing a large ecosystem of LoRa-based sensors, network gateways and servers. Chris Chang, Semtech’s Sr. Vice President of Corporate Marketing and Business Development, was in attendance at the signing ceremony; read his blog about the experience. In August, Tencent, a leading Chinese provider of internet value-added services, announced it’s membership of the LoRa Alliance™. The LoRa Alliance is a non-profit association of more than 500 organizations committed to the LoRaWAN open specification and the continued success of LoRaWAN. In joining the LoRa Alliance, Tencent provided its full backing for LoRa Technology, further evidenced by its investments in technology and applications for LoRaWAN-based IoT solutions, and plans to establish a LoRaWAN-based network for the city of Shenzhen. The same month, the world’s largest telecom tower operator, China Tower, announced its strategic partnership with Alibaba, providing access to the 1.9 million tower sites China Tower manages nationwide. Access to the towers means Alibaba could utilize the infrastructure to quickly deploy LoRaWAN-based solutions for smart city, transportation and asset tracking. Rounding out a busy month, CLAATEK, a wholly-owned subsidiary of ZTE and member of the LoRa Alliance, announced the creation of the “LoRa Connection Management Platform” with China Unicom and Semtech. This project will develop an open and high quality IoT network management platform for LoRa Technology. The platform’s products include a network server, join server and BSS operational support systems. The management system should help customers and developers with their growing need for an easy-to-use system to keep track of, and operate their LoRa-based devices. The following month in September, Alibaba Cloud hosted its Cloud Computing Conference in Hangzhou. At the conference Alibaba announced the bold “Operation Darwin,” with the end goal to promote the advanced coverage of LoRa Technology, and popularize IoT through a series of full-link ecological services. In a powerful display of LoRa Technology’s potential, Alibaba Cloud released an airship to the sky. Fitted with a LoRa-enabled gateway, the airship provided network coverage to sensors located 20 meters underground from 40,000 meters above the conference. Though widespread deployments to the sky may seem like science fiction now, a deployment such as this could provide up to 700 sq. kilometers of coverage. When the conference concluded, attendees were buzzing with excitement for the future of IoT. Chris Chang was one such attendee, and recounted the conference’s events and his experience seeing the airship firsthand, in another blog. Interested in learning more about the LoRaWAN specification and the companies committed to its continued success? The LoRa Alliance, an association of more than 500 member companies, supports the interoperability needed for LPWA networks to scale, making the LoRaWAN specification as the premier open source technology solution for global LPWAN deployments. Visit the LoRa Alliance’s website for more. LoRa is registered trademark or service mark, and LoRaWAN is a trademark or service mark, of Semtech Corporation or its affiliates.